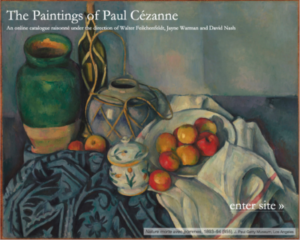 Any attempt to understand Cézanne’s earliest development is confused by uncertainty about authorship: we simply cannot say with confidence that all of the paintings credited to him – particularly in the earliest years — are in fact his. They include nine landscapes and a very large canvas now cut into pieces. The very first picture from those years whose site has been documented – the self-assured Aqueduc gallo-romain, ancien chemin d’Aix à Meyrargues – seems competent beyond its years; it handles the composition, the light, and the textures, with a rare confidence. 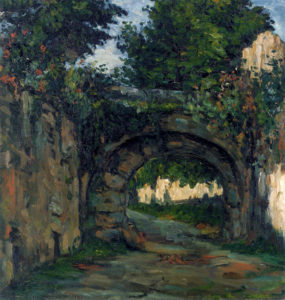 The arch is just off-center; the eye easily follows the road from a point at the bottom of the composition up to the stonework, and then turns back to the left beyond the arch; the sense of space is clear, unfaltering. The shadowed masonry, which demands that the painter know how to portray the warmth of the stone and the coolness of the light at the same time, is very skillfully handled; indeed, the juxtaposition of brown-reds with blues and blue-greens realizes just the effect needed (an effect admittedly spoiled by the recently applied protective coating). But the most notable character of the painting is the controlled, rhythmic impasto: it is set down not impulsively, as in the landscapes painted just a little later, but with a thoughtful discipline. Its touches represent, with full command of the medium, both the recession of the wall on the left and the radial, fan-like turns of the stones in the arch. We are at liberty to see this painting as a work before its time, or to suppose that it was done by another painter. In either case, it does not help us construct a coherent picture of Cézanne’s earliest development; it is more self-assured than the other landscapes credited to these two years, and its surface is more controlled than any of the landscapes painted in the two years that follow. By Alain Mothe, who discovered the photograph in a website devoted to tourism in Aix-en-Provence. 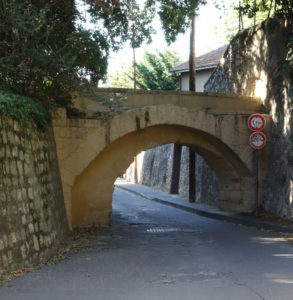 Consulting the land-registry of the time, François Chédeville proposed the present title, which evokes not only the place but also the time : the name the street probably bore in Cézanne’s time. The photograph published here is from 2013.